Wow, Helen and Mr. M. sure are persistent! After losing now SIX eggs here at the museum, they’ve gone on to lay yet MORE eggs at another site! Last week, Mary got a call from the foreman working on construction of a nearby skyscraper. 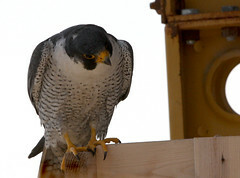 It seems as though a pair of peregrines had decided to nest at the construction site. Since we’d lost track of Helen and Mr. M. and the site was SO close to the museum, all of us had our suspicions regarding who the pair might be, but today we went to find out for sure. First off, I have to say how excited I was to be going up into a skyscraper that was under construction. The experience did NOT disappoint. First off, we met a ton of people and they were all amazing. Second, I finally got to ride in one of those construction elevators that goes up the outside of skyscrapers when they are being built. 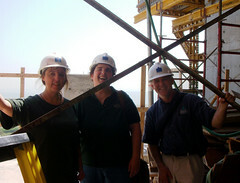 Third, I … got to wear a HARDHAT! Love, love, love. When we got up to the top of the building, we had a roman ampitheater sort of situation – a lot of the workers stopped to watch the goings-on. Mary and Matt concentrated on making the site safe for our feathered friends while I took many pictures of the two adults. The female, who did indeed turn out to be the museum’s own Helen, landed maybe once the whole time. 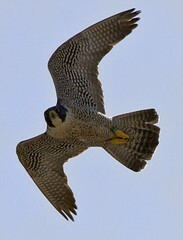 For the most part, she was in the air, swooping and diving down towards us in an effort to drive us away from the eggs. The unbanded male, obviously Mr. M., on the other hand reminded me so much of Wacker’s Etienne. He landed on a nearby girder and simply refused to budge the entire time. He tracked every movement and made soft calls of warning the whole time. The two were brooding two eggs. The area they chose was not terrific. We did what we could to make the situation better, but think there is a high likelihood that they will abandon the nest soon. In all actuality, it wouldn’t be the worst thing to happen. Next year, we’ll have a nice cushy nest box up for them on the museum (although that is no guarantee they will actually use it). With any hope, they will find the box to their liking and bring some beautiful museum falcons into the world. For now, both look healthy and hearty and we hope for the best for these two eggs! ~ by Steph on May 6, 2008.